1792 Bourbons are a select (sister) brand of Buffalo Trace—one of the most awarded distillers in Kentucky. They in turn are owned by Sazerac—the New Orleans creators of the eponymous Sazerac Bourbon Cocktail and diviners of dozens of classic Bourbons we all enjoy (Thank you Sazerac!). Why call it 1792? Because that was the year Kentucky became a state of course! And nothing screams Kentucky more than this classic American Whiskey from a classic American company. By law, Bourbon must be at least 51% Corn mash. The rest can be almost anything, but is usually a combination of barley, wheat, and rye grain spirits. 1792 is a “High Rye Bourbon” which means that, while some Bourbons might have as little as 10% Rye, 1792 has significantly more ... as much as 30%. The exact proportions vary a bit because this is a “barrel select” Bourbon, which means that the Whiskey master is not trying to satisfy a scientific formula or government regulator, he is mixing barrel lots to achieve the perfect taste (as he should!). 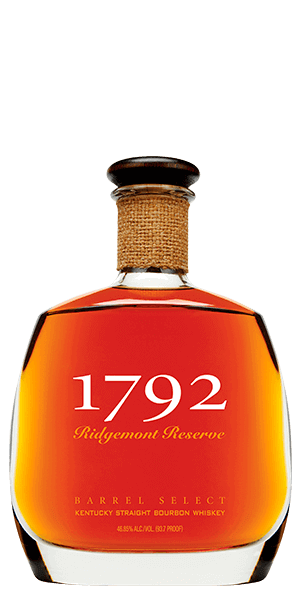 1792 Ridgemont Reserve Bourbon Barrel Select is like drinking America in a bottle: Brash and full-bodied ... spicy but balanced. Great to drink neat, but the rich texture and spice make it a perfect foundation for a Mint Julip, Classic Manhattan, or Sazerac Cocktail. Boom! What does 1792 Ridgemont Reserve Bourbon Barrel Select taste like? The Flavor Spiral™ shows the most common flavors that you'll taste in 1792 Ridgemont Reserve Bourbon Barrel Select and gives you a chance to have a taste of it before actually tasting it. A good everyday whiskey. Rye, vanilla, and caramel notes, with the nose a bit too heavy on the alcohol. Lighter flavor, no single overpowering note. Good, clean finish. Great bourbon with a long finish, hits a good deal of the tasting notes with a slight cinnamon finish. Not my fav but definitely drinkable. Harsh slightly....but not bad on the rocks. Excellent bourbon. Smooth with a sweetness, yet simultaneously it has a kick of spice and pepper. For mid-range bourbon, this is a solid option. Like another review said, "not as smooth as I would like". You can tell it has a high rye content, but it isn't a Rye whiskey. Seems to have a flavor that can't tell if it wants to be Rye or Bourbon. I love Rye whiskey and Bourbon whiskey, but I didn't love this middle of the road flavor. I bought a bottle of this simply because of the ratings I found in Flaviar! I couldn't be happier with it! A new permanent bourbon in my bar. I HAVE TWO BOTTLES OF IT AND IT IS GREAT, I BOUGHT THREE AND GAVE ONE TO A BUDDY FOR CHRISTMAS LAST YEAR AFTER I CRACKED ONE OF MY BOTTLES TO GET A TASTE, LOVED IT!! Was at their distillery this past week. this is supposed to be their premium brand and I was very disappointed. A new chocolate liqueur only available at the distillery was better than this. Not as smooth as I like. Was able to enjoy without a problem though, just wasn't for me. Tried years ago and really liked it. Def. a solid premium bourbon.